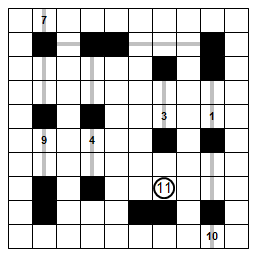 This is a Tuesday Slalom puzzle. This entry was posted on December 8, 2009 at 5:00 am and is filed under Slalom,  Mon/Tues. You can follow any responses to this entry through the RSS 2.0 feed. You can leave a response, or trackback from your own site. Holy crud — the black cells AND the gate numbers are arranged symmetrically. Don’t tell me that’s going to be your theme this week.